On Monday, June 25, 2007 at 2.30 p.m. the auditorium of the Theatre of Estates in Prague was filled with the „patrons“ who with their financial contributions support humanitarian, artistic and other projects. The organizer (and presenter of the event) Mr. Richard Langer and his daughter Marketka welcomed the representatives of many companies, individuals and organizations that know how to help the others. Among the Centipede friends were also Army General Pavel Stefka – the vice president of the movement, General Major Josef Proks, Col. Lt. Petr Milcicky, Mjr. Karel Kout and many other representative of the army. This year, Mrs. Bela was the member of the „D award“ jury for the first time. She had the opportunity to decide upon granting the prize not only in her name, but in the name of the movement „On Own Feet“ as well. The range of the nominees was very wide this year – the nominees for the award were many of the Centipede teachers, schools and friends, and also the peace corps of the Czech Army that have been participating in the realisation of the Centipede project since last 7 years, in the Balkan countries, Iraq and Afghanistan. When Mrs. Bela entered the stage, the Centipede anthem sung by the children’s choir Mariela of the 15th elementary school in Plzen could be heard. After reading all the names of the nominees, the winners were announced. 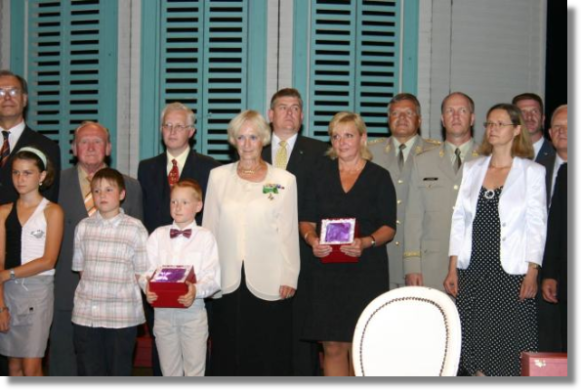 The „D award“, given by Mrs. Bela, won the peace corps of the Czech Army. The representatives of the army – Gen.Mj. Proks and Col. Lt. Milcicky – received the award. One more prize was granted to Mr. Petr Rehor who supports the Psychiatric hospital for children in Oparany very significantly. Let us congratulate to all the awarded people.